U6 Boys and Girls did warriors so proud at the HSBC tournament at the sevens. The warriors team came out the blocks firing with a great win in their first match v Hurricanes by 4 tries to 3. We then came up against a very strong and physical Arabian Knights team which unfortunately we lost 5 tries to 3. Warriors then made sure we learnt from our mistakes in our previous match and put things right with a 6 tries to 4 win over Al Ain, scoring all those tries in that game made all the difference as the group ended with 3 teams all winning two games and losing one. Warriors ended up topping our group on tries scored. After a bit of a wait we played the Cup semi final against the Exiles which unfortunately losing 4 -3 after having 2 tries disallowed. I would like to congratulate all the Warriors U6 team on their great effort and commitment over the weekend. U7 I’m so proud of our players. They made it through to the Cup Final only to lose to the Hurricanes in a tight 20-15 match. The journey to the final speaks miles about how our U7 squad is developing. We had tough pool round games against a stingy Heartbeat Tigers team, a less than impressive Exiles team and a developing Al Ain squad. The U7’s finished top of the table with a 3-0 record, which put us straight into the Cup Semifinal against Doha. The quick Doha team proved to be one of the toughest matches of the day, however the squad was victorious in overtime. There were tears of joy from many of the players and parents, who were proud of the players in their victory. The final against the Hurricanes was challenging. It had been a long day in the sun. Unfortunately, the Canes were pushing up extremely fast in defence limiting our running room. Our squad’s stingy defence held them at bay, but the Canes managed to score an extra try for the win. Again, I’m very proud of our U7 squad. Their defensive line was impressive. In fact, I got comments from other coaches and parents about how well they held their line. We’re really developing. Now we just need to focus on running straight and staying in bounds and we’ll be a dominant force. U11 The coaches were really pleased with how the tournament went considering the difficulty of the draw. What impressed all most was the heart the boys played with, they are becoming more consistent with their efforts and rarely give up. WE ARE SOOOO CLOSE TO UPSETTING A BIG TEAM!!!! Picking individuals out is difficult but two players that stood out for the coaches were Aaron and Crusher (Christian). Most Improved player – Aaron Warrington (centre); Most Valuable Player – Christian Corby (Scrum Half); Top try scorer – 2 tries each scored by Nathan Wastie, Hugo Swann, Aaron Warrington, Declan Mannion and Thomas Cowan who scored 2 for Warriors and 1 for the Baa Baas! And a big shout out for Dylan Greig who joined the Baa Baas to get some good rugby experience – played 6 pool games and played as a true Warrior! U12 The U12s started with 14 players on Friday morning. Luckily we had the 5 players from the Quins to help us out. We were entered into the A division and it was a tough group. These fighters really gave all they had and by the end of the day we had lost two warriors boys. One suspected concussion, which later on was ruled out, and the other a pulled back muscle. 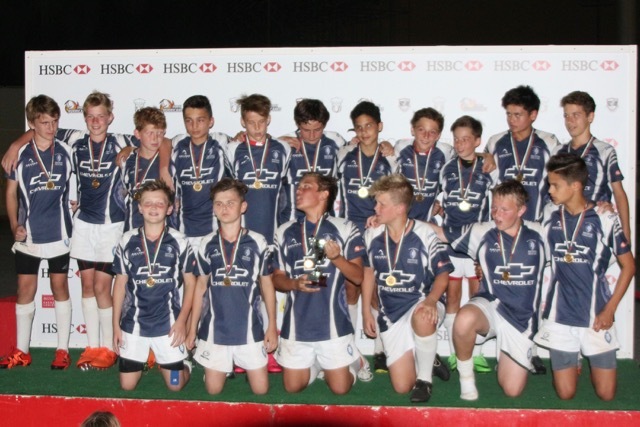 The day ended with us losing in the bowl final to Doha. Callum MacGillicuddy for the forwards. Since we lost so many players from our original team we had to move boys around. Warriors are so proud of our girls!!!!! U12 girls tag team won “The Bowl” trophy. Their first ever game was at the tournament, first ever tournament for warriors girl team.